I don’t love the shorter and cooler days of fall but I do love the food it brings. Fall always remind me of my earlier years living in Seoul; I was born in South Korea and lived there until I was seven so I have some very clear memories. Each year, on Korean Thanksgiving (Chuseok, an autumn harvest festival period) our entire family on my dad’s side would go hiking up the hills to our ancestors’ burial ground. On the hike, we would spot chestnuts that fell off the trees and my cousins would help me peel off the spiky outer layers. Once we got to the burial site, seasonal fruit like persimmons and Asian pears would be laid out as an offering. To this day, I look forward to the fall just for the food. 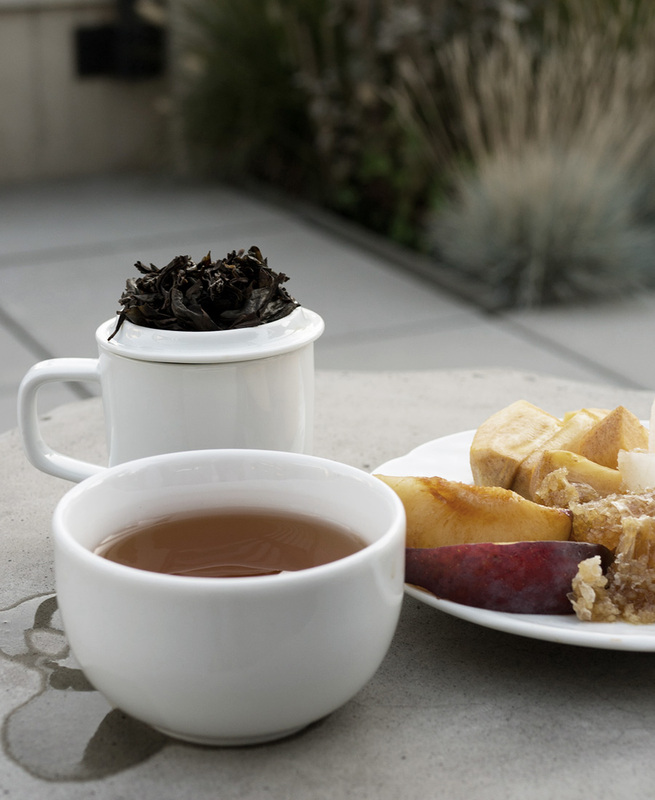 When Sara, Georgia, and I were figuring out what to pair oolong tea with, fall fruit just seemed like a great match — it’s fresh, seasonal, and goes great with oolong tea. 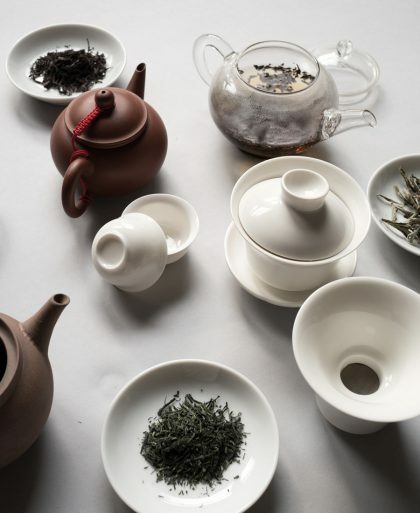 Oolong tea is between a green tea and a black tea in terms of how it’s processed so I like to refer to it as the Goldilocks of tea — it’s not too light and not too strong. 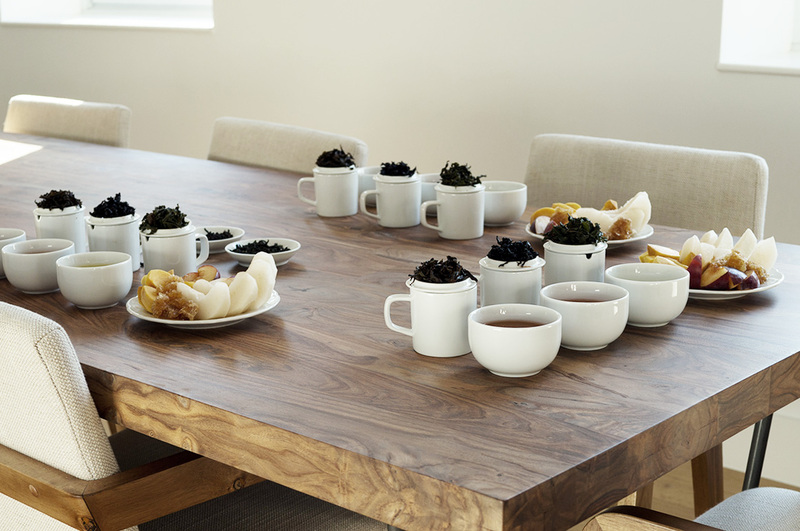 We cupped three oolongs: Wenshan Bao Zhong, Tie Guan Yin (Iron Goddess), and Xiao Hong Pao (Little Red Robe). 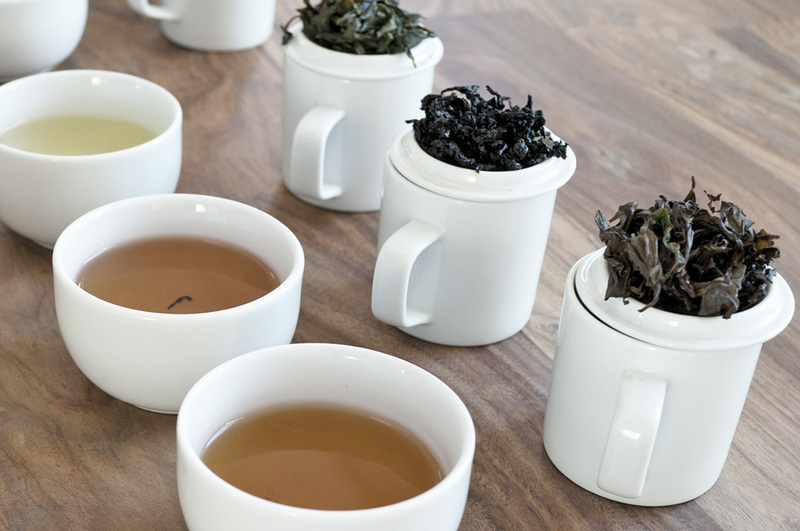 We like to taste from light to dark and as you can see in the photo above, the Wenshan Bao Zhong, which we had first, is the lightest in color (and in taste) from the other two oolongs. On the fruit plate were slices of Asian pear, plum, and persimmon. We added a touch more sweetness by having it with comb honey. Starting with the lightest oolong, the Wenshan Bao Zhong from Tillerman Tea had some flavor notes similar to green tea in that it was vegetal, tasting a bit like steamed greens but also had a hint of floral. With a medium body, it wasn’t bitter at all and went best with the pear. The pear was juicy and mild in taste so it didn’t overpower the light flavor profile of the Wenshan Bao Zhong. The second oolong was the TGY (Tie Guan Yin) from T Shop. It’s a roasted oolong (my favorite kind) and it tasted like heavily roasted barley. Delicious. The pear kind of disappeared, flavor-wise, and couldn’t hold up to the tea until I had it with some of the comb honey. The persimmon with its sweetness went really well, especially with the honey. 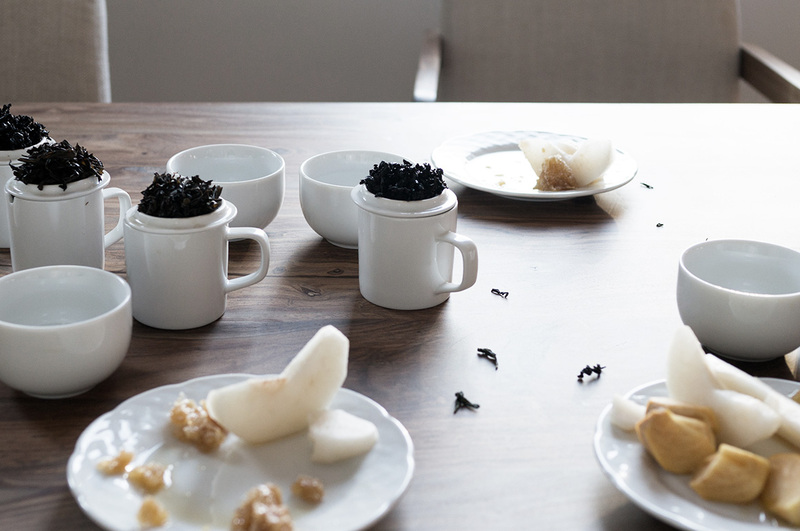 The third oolong we steeped was the Xiao Hong Pao (Little Red Robe) from Seven Cups. Very similar in color to the previous oolong, it was nice and roasty, full bodied and had a sweeter finishing note. This was the most intense of the three and it went well with the persimmons but it paired perfectly with the plums. 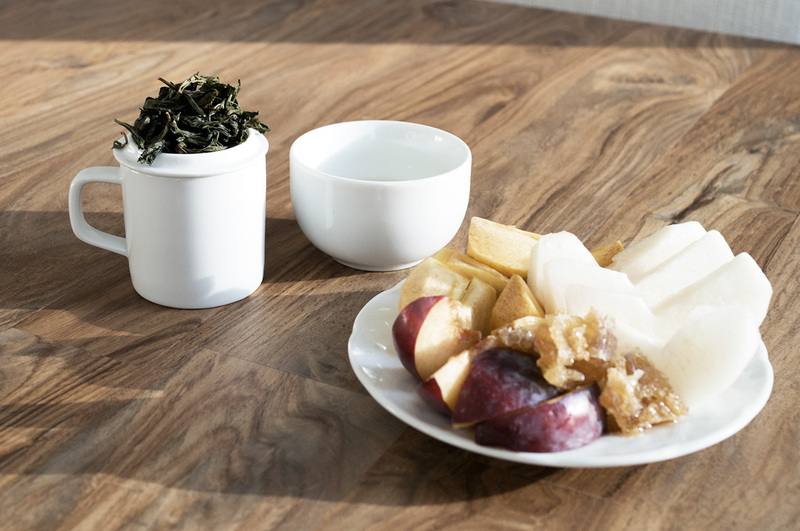 What I really got out of this pairing was that almost any food will go great with oolong if there’s a little honey; It intensifies the oolongs and brings out the best characteristics of the tea. 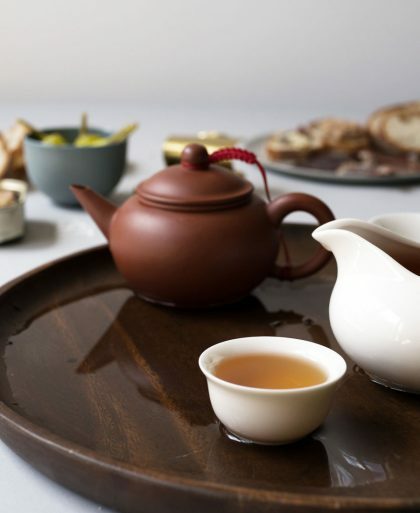 Thinking of this tea pairing hack, soft cheese and honey paired with oolong would be amazing. I am so happy with our collaboration, too! Hi Georgia, we do! Loved reading your post! Nice…! 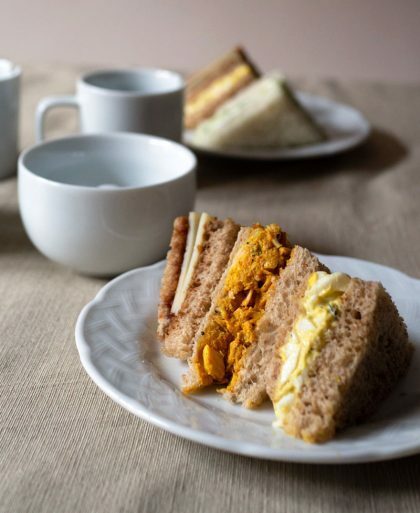 i loved reading your post and i love your tea pairing idea. Thanks for sharing…!